So you're interested in adopting one of our Adopt A Bulls- What's Next? - We will contact you to ask some follow-up questions and to tell you about the pet you're interested in adopting. Be patient- the process may take several days or even weeks and we may need to do multiple meet & greets (especially if there other pets in your household already). We want to make sure that our Adopt A Bull is the right pet for your family. Be open minded- we may have another pet that is perfect for your family. Although he or she may not be the pet you were originally drawn to, they may be best match for your family (especially if there are other pets or children in your household). Be ready to take it slow- adding a new family member to your home (whether 2-legged or 4) is often an adjustment for the current members of the household. Keep in mind that slow introductions in a controlled environment are the key to a happy family. Remember to have children and other pets meet the new pet with adult supervision and try to avoid confined spaces where your new pet may feel nervous or cornered. On-leash side-by-side walking is the best way to get your new pet to meet their new canine sibling(s). We often receive multiple applications for a particular pet. Our goal is to make the best match for both your new pet and your household. We do not place pets on a first come, first serve basis. We may suggest a different pet if the one you apply for is not a good match. We love all of our past & present Adopt A Bulls so please send us pictures, e-mails, cards, letters, or anything you can think so we can see how your new pet is doing in their forever home. We will also check up periodically to make sure your new family member is adjusting and to see if you have any pictures or stories to share with us! 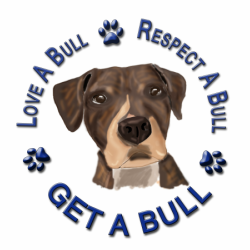 Please feel free to e-mail us with any questions regarding any of our Adopt A Bulls or at any time during the process.